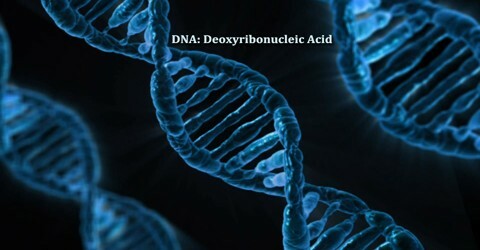 Deoxyribonucleic Acid or DNA is the language of genetics. Just like a language is composed of words, nucleotides are the words used to write DNA. If nucleotides are the words, then a sequence of nucleotides would be a sentence. Many of the nucleotide sequences are conserved (the same) between species and people. 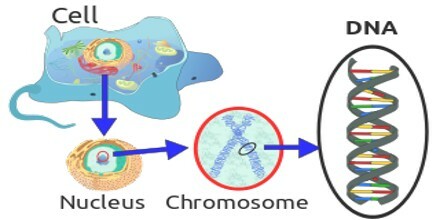 DNA is an extremely long macromolecule that is the main component of chromosomes and is the material that transfers genetic characteristics in all life forms, constructed of two nucleotide strands coiled around each other in a ladderlike arrangement with the sidepieces composed of alternating phosphate and deoxyribose units and the rungs composed of the purine and pyrimidine bases adenine, guanine, cytosine, and thymine: the genetic information of DNA is encoded in the sequence of the bases and is transcribed as the strands unwind and replicate. Deoxyribonucleic Acid or DNA was first isolated by Friedrich Miescher in 1869. Its molecular structure was identified by James Watson and Francis Crick in 1953, whose model-building efforts were guided by X-ray diffraction data acquired by Raymond Gosling who was a post-graduate student of Rosalind Franklin. DNA is used by researchers as a molecular tool to explore physical laws and theories, such as the ergodic theorem and the theory of elasticity. The unique material properties of DNA have made it an attractive molecule for material scientists and engineers interested in micro- and nano-fabrication. Among notable advances in this field are DNA origami and DNA-based hybrid materials. DNA (Deoxyribonucleic Acid) contains the instructions needed for an organism to develop, survive and reproduce. To carry out these functions, DNA sequences must be converted into messages that can be used to produce proteins, which are the complex molecules that do most of the work in our bodies. Each DNA sequence that contains instructions to make a protein is known as a gene. The size of a gene may vary greatly, ranging from about 1,000 bases to 1 million bases in humans. Genes only make up about 1 percent of the DNA sequence. DNA sequences outside this 1 percent are involved in regulating when, how and how much of a protein is made. What is DNA or Deoxyribonucleic Acid made of? DNA is made of chemical building blocks called nucleotides. These building blocks are made of three parts: a phosphate group, a sugar group and one of four types of nitrogen bases. 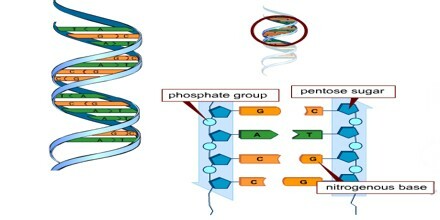 To form a strand of DNA, nucleotides are linked into chains, with the phosphate and sugar groups alternating. 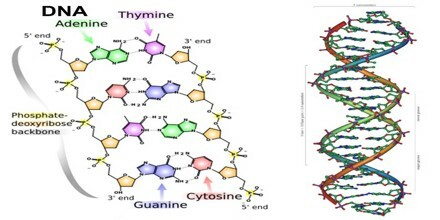 The four types of nitrogen bases found in nucleotides are: adenine (A), thymine (T), guanine (G) and cytosine (C). 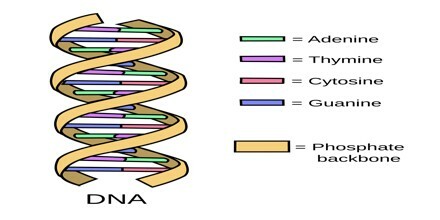 The order, or sequence, of these bases determines what biological instructions are contained in a strand of DNA. For example, the sequence ATCGTT might instruct for blue eyes, while ATCGCT might instruct for brown. The complete DNA instruction book, or genome, for a human contains about 3 billion bases and about 20,000 genes on 23 pairs of chromosomes. Where is DNA or Deoxyribonucleic Acid Found? In eukaryotic cells, Deoxyribonucleic Acid or DNA is found inside a special area of the cell called the nucleus. Because the cell is very small, and because organisms have many DNA molecules per cell, each DNA molecule must be tightly packaged. This packaged form of the DNA is called a chromosome. Researchers refer to DNA found in the cell’s nucleus as nuclear DNA. An organism’s complete set of nuclear DNA is called its genome. Besides the DNA located in the nucleus, humans and other complex organisms also have a small amount of DNA in cell structures known as mitochondria. Mitochondria generate the energy the cell needs to function properly. In sexual reproduction, organisms inherit half of their nuclear DNA from the male parent and half from the female parent. However, organisms inherit all of their mitochondrial DNA from the female parent. This occurs because only egg cells, and not sperm cells, keep their mitochondria during fertilization. 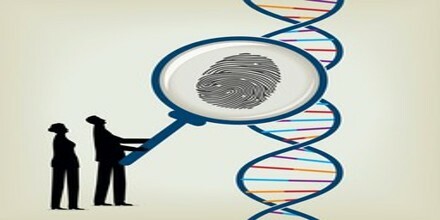 It is possible to identify and assess genetic information via DNA fingerprinting. This process can be used to determine biological relationships, diagnose various genetic disorders, establish whether or not an individual is carrying a genetic mutation that can be passed on and reveal whether a person is at risk for certain genetic diseases. DNA testing is also used in forensic science and plays an important role in law enforcement. DNA information is unique to every individual, which makes it easier to identify suspects.